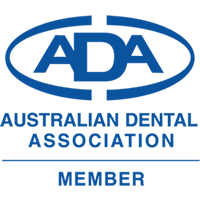 Mt Martha Dental Dentists take xrays so we aren't guessing about your dental health. And we don't want to guess where your health is concerned! What is the difference between x-rays and radiographs? Why does my dentist want to take x-rays when you can see a hole in my tooth already? I am not keen on the risks of radiation! Dentists can not see what's happening on the inside of the tooth or where two teeth are tight together. Saves teeth, money and time to find decay early -before it has caused pain or big problems. 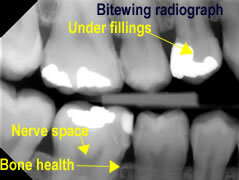 1.Bitewing radiographs are regularly taken to look for decay. These are called 'bitewings' because we get you to bite on a 'wing' to hold the radiograph is position while we take it. 2. Periapical radiographs show the entire tooth so dentists can see the root and bone surrounding the tooth. 3. Orthpanomograms OPG's are taken to show the entire upper and lower teeth including the roots. These x-rays are not as clear as bitewings and periapicals so they are not used to look for decay. These x-rays are most commonly used when looking at wisdom teeth and for orthodontic assessments. 4. CBCT - Cone Beam xrays. These take multiple xrays that are layered so they give a 3D picture of your teeth. These are very helpful for implant placement. The term "x-rays" and "radiographs" are used interchangeable in most medical and dental settings. Technically the x-rays are the type of radiation used to produce the image that the dentist views. The actual image is called a radiograph. It will save time and money to know how far the decay has progressed and where the nerve is in the tooth. Other holes may be found in the same tooth. Neither are we. Fortunately new technology has meant that we are able to limit exposure to radiographs.The radiation received from one dental x-ray is less than that received from an interstate airline flight. Remember to be careful also with televisions and other forms of household radiation. If you have any concerns with this please discuss it with the dentist.